Character: Brewed with five types of hops, five pounds in the dry hop. Chinook, CTZ, Centennial, Galena and Amarillo were used. Here we have another great beer brought to Texas by my awesome friend, Halie. The past couple of times she would come back to TX to visit family and friends, she would bring me back a care package of Colorado beers. I am so grateful for awesome friends like her. She will be moving back to TX very soon, so maybe one more box of goodies might be coming my way. We shall see. For now, please check out her amazing artwork portfolio. 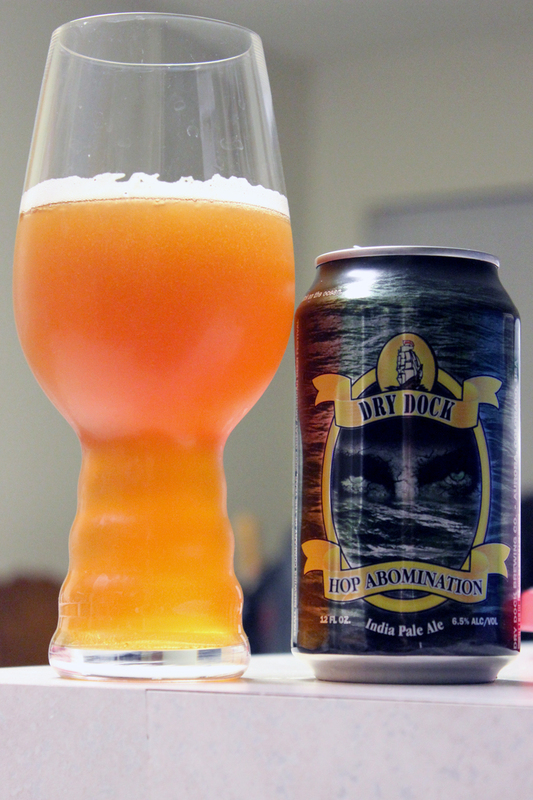 This was my first time tasting anything by Dry Dock Brewing Company. I must say, that I am rather impressed by this beer, and I look forward to one day, hopefully being able to taste some more. This American IPA of course, gets the appropriate treatment by being served in a glass designed specifically for the India Pale Ale. Hop Abomination poured a hazy, light copper color, very similar to natural orange juice. The beer is topped with a thin layer of white bubbly head, which had good retention throughout the session, leaving spotty web-like lacing down the glass. The nose was quite pungent. All hop driven, for sure. There is strong citrus, mango, pineapple, and some grapefruit notes, mixed with some pine, grass, and a little dank resin. Mostly fruit notes though. There is a faint scent of grains, and fluffy biscuits in the back of the hop profile. Very inviting aroma. The taste follows the nose. The hop presence is right up front and powerful. Main flavors are citrus orange, mango, pineapple, grapefruit blended with pine, grass, and a subtle dank resin flavor. A malt & gran body follows the hop flavors, mixed well with a fluffy breakfast biscuit taste in the back. Fruity hop flavors linger around for some time after, but it’s not a complete palate killer. Nice moderate carbonation, good crisp body, with a smooth mouthfeel all wrapped up in this not so heavy, medium body. Overall, I was honestly expecting more bitterness in this beer, more of a hop bomb, you know. I guess the name Hop Abomination led me to that conclusion. This beer is definitely not bad. In fact, I still really enjoyed it, and gave it a high ranking here on the site. Don’t get me wrong, the hops were definitely presents and in your face, but I guess I just wanted more with a name like Hop Abomination. I will say this though, to the average beer drinker, or newbie into Craft Beer, I’m sure this one will be a hop bomb to them. Remember, this is just my opinion of this beer, and we each have different tastes! Cheers, my friends! Metal Connection: Went to the Metal vault for this little gem here. The name of the beer was too easy, and yes I could have chosen a million Metal songs that use the word “Abomination” in the title, but I would rather go old school and choose the band named Abomination. 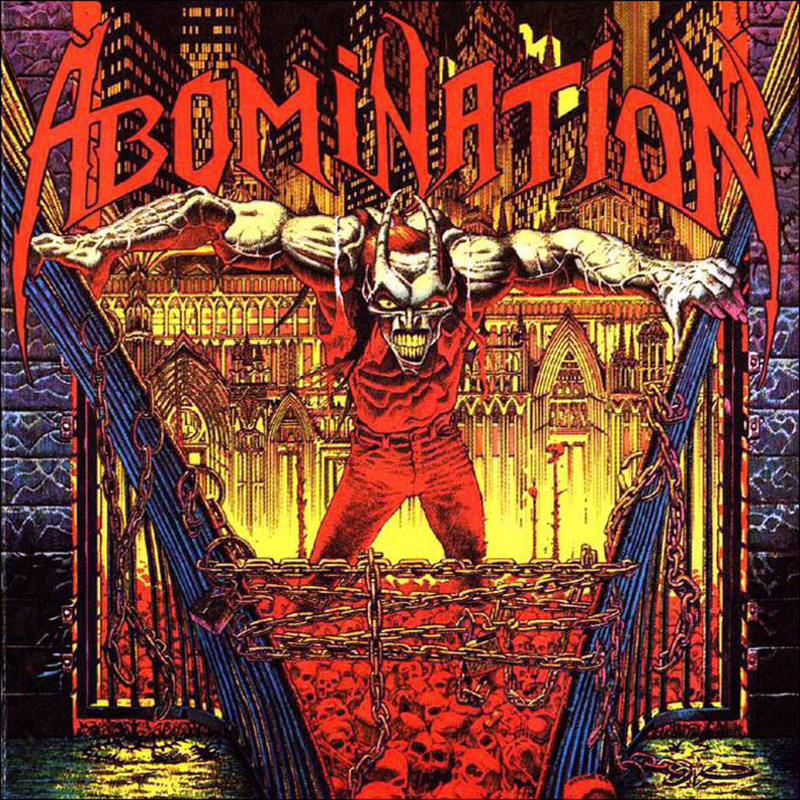 Abomination is an early band for the Underground Metal legend, Paul Speckmann, who has been kicking around our beloved Metal scene since the early 80’s. Speckmann was part of Death Strike who put out their first demo in 1985, yes the same year that Bon Jovi put out their second album 7800° Fahrenheit. Crazy when you think about that. Speckmann would later form Abomination in 1987, and then releasing their self titled debut album in 1990 on Nuclear Blast Records. This song, “Victim of the Future” comes to us from this album. This is one of my favorite tracks on this album, and I thought this was a perfect pairing. The right song to thrash around to while enjoying a solid American IPA.